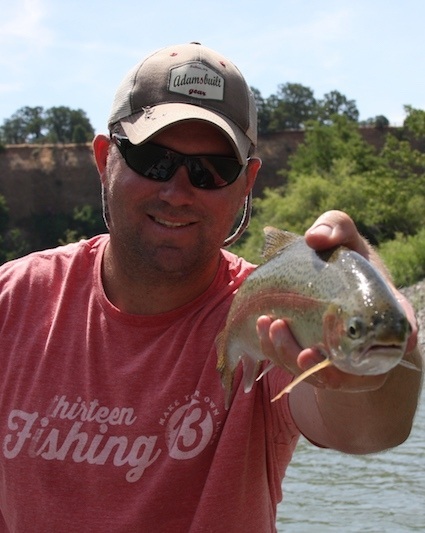 River Pursuit Guide Service is based in the Red Bluff area of Northern California, providing river fishing adventures to anglers primarily on the Sacramento and Feather Rivers. We pride ourselves on using the best equipment, and our local knowledge, to provide our guests with a superior river fishing experience. Our professional guide will provide exceptional opportunities for our guests to experience wild trout, steelhead, salmon, and striper fishing at its finest. Sacramento River fly fishing is a year ’round opportunity. Trips are done from large, comfortable drift boats and all tackle is provided along with lunch. We offer very competitive rates! Salmon fishing takes place during the summer and fall, with the run typically peaking in September and October. We use light tackle from open style jet boats for fish that average 15-25 pounds with much larger salmon being taken throughout the season. Please request prime dates well in advance. Striper fishing takes place during the spring from late March until mid May depending on water conditions. Plenty of action on hard fighting fish during some of the best weather is the main attraction to this fishery. Trips are conducted from jet boats, typically on the Sacramento River near the city of Colusa, or on the Feather River near Yuba City. For discounts, special offers, and updated reports with photos and video, check out our media links below and sign up for the email newsletter.